Correlating to that increase in spend is the increase in consumed video content. 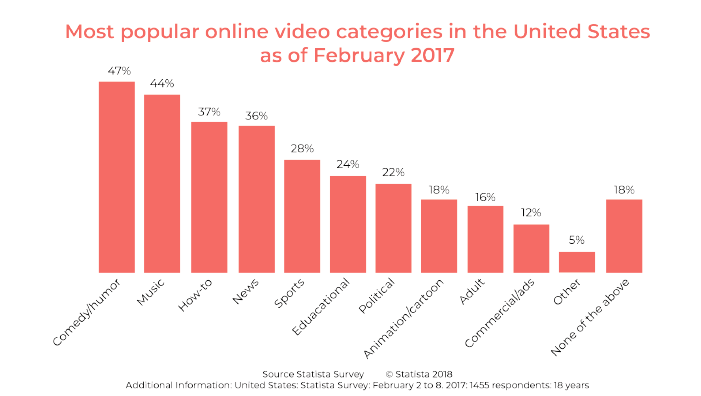 36% of users are consuming video content daily. And more than 50% of consumers surveyed are consuming video at least once a week. As consumption increases, so must a brand’s presence in that space. Wondering what kind of content they’re consuming? Funny is first. Our own social brands are exploding. Check out: It’s a Southern Thing, SEC Shorts and So True Y’all. Rather than interrupting videos with pre-, mid- and post-roll, brands are effectively accessing the audience as a part of the show through exclusive video sponsorships inclusive of video title cards and watermark logos.